Shopping for make-up can get pricey and sometimes we just can't afford those high brands all of time and need to look at other brands at an affordable price! That's why I thought I'd do this post showing you some products I love which are all under £5!!! For such amazing price the quality is extremely good value for money and these products I go back for time and time again. First up Collection - This brand I have been pleasantly surprised with over the past year and I've tried quite a few of there products, which I've been really happy with! (including there liquid felt tip eyeliner which I've talked about so much I just couldn't add it to this post as well haha!) Firstly pictured is Lasting Perfection Concealer (£4.19) which is extremely popular and a brilliant concealer! I get number 1, the lightest so it can be used to highlight the under eyes or cover blemishes, as it has a great coverage which lasts all day! Then you have the Gothic Glam Lipsticks (£2.99) they have 3 colours in this range and I have them all, they are really deep plums and red shades so perfect for autumn and winter, pictured above is 1 - seduction and is actually one of my all time favourite lipsticks which I always go back to, it is a beautiful deep red/plum shade and has a great pigment, it just shows drugstore products can be just as good as high end! Seventeen - The Miracle Matte Powder (£3.99) is great to wear on it's own for a little coverage and to matte the skin or can be brushed over the top of your foundation, I keep it for everyday use in my makeup bag and is perfect to touch up throughout the day! It is a great drugstore alternative and lasts forever! Seventeen also have great lipsticks and lip glosses you might want to try, a lot of which are bright and colourful for spring and summer or a nice pop of colour to brighten your look! Rimmel - This is a lovely brand which have some great products for great prices (most just over the £5 mark so I haven't mentioned in this post) but I had to mention there Eyebrow Pencil (£2.99) I know it is super basic but I have used this I'm sure since I started to fill in my brows (and thankfully never looked back since - I swear it looked like I had no eyebrows when I was younger!) I love the shade it comes in, I get dark brown and it matches perfectly! I normally use a wax and powder but some days I just want a quick fill in and go, and this comes in super handy! 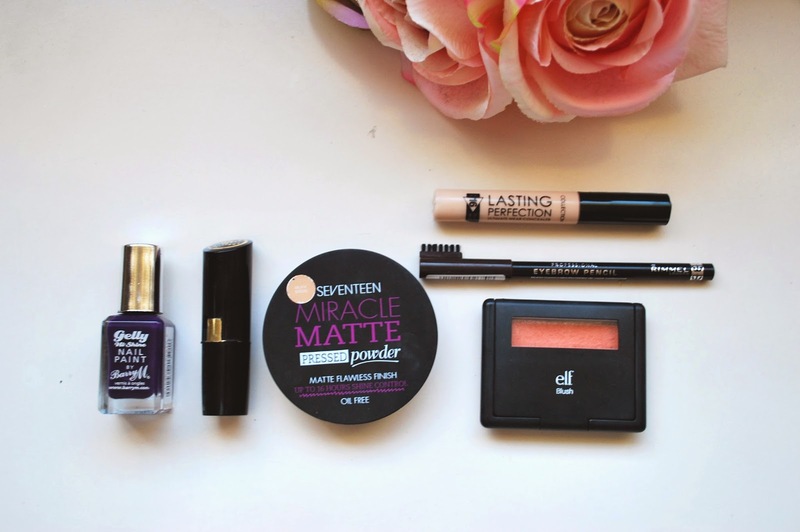 If you need a drugstore alternative or looking for cheaper products to try, check out Rimmel I'm sure you'll find something you love at an affordable price! Elf - I remember hearing about Elf years ago and checking out the website but never ended up getting anything! But when I was shopping in Florida last year they had a stand at Walmart full of Elf products and I couldn't believe how cheap it was and it was nice to see them in a shop rather than online! So I bought a tonne of stuff and I find some of the products lovely especially for the price! This is the Blush - Twinkle Pink (£3.95) which is a lovely coral shade, it is very powdery and a lot can go on the brush if your not careful but it is a lovely product especially for spring and summer when those coral shades we love come out! I also love the liquid eyeliners and translucent setting powder, check out there website the prices are unbelievable and they have so many products to choose from! Barry M - When I was planning this post I just had to mention Barry M nail products (£2.99-£3.99) I know the majority of people have tried this brand but I just had to add them to this post, I love the Gelly Hi-Shine range, the one pictured is 348 Plum. The selection of colours are amazing and they are such good quality for a great price! There are so many great products out there for amazing prices, trust me I could have sat here all day and listed products but sometimes I just need to take it easy and narrow down my favourites, because I wasn't joking when I said I would sit here all day and talk about them! If you spend time looking for dupes or alternative affordable make up it's surprising how they can soon become your favourites!